Having a new member added to the family will always be worth announcing, why would you even try to keep it a secret from other people? Regardless of the causes, the consequences, or the risks at stake, a baby will always be a blessing to a family. While most people would hold a celebration during the baby’s baptism or naming ceremony for other cultures, there are also those that prefer to hold a separate celebration simply to announce their newest addition to the family, and this is referred to as a baby announcement celebration. 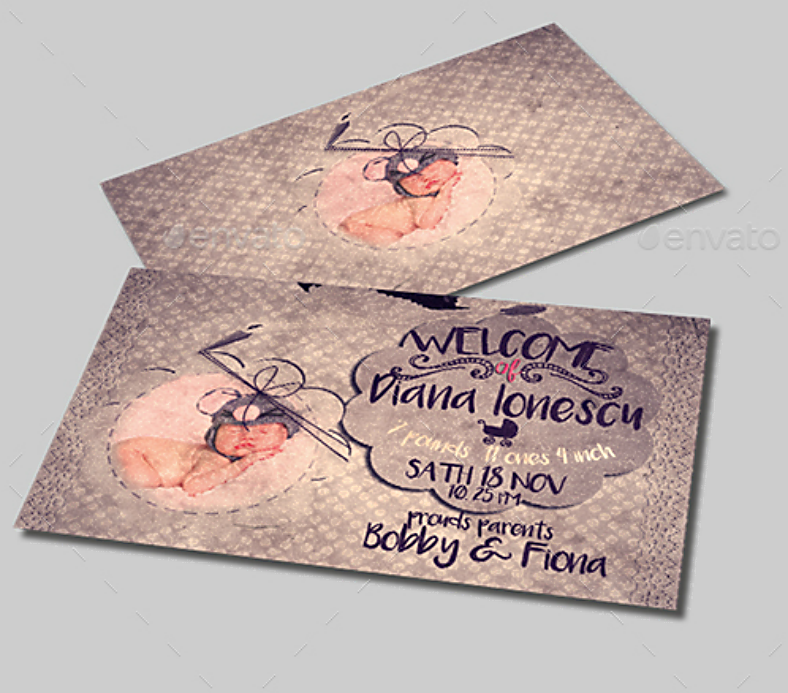 And just like any other event, celebration, or party, invitation cards are involved here in order to gather up guests. 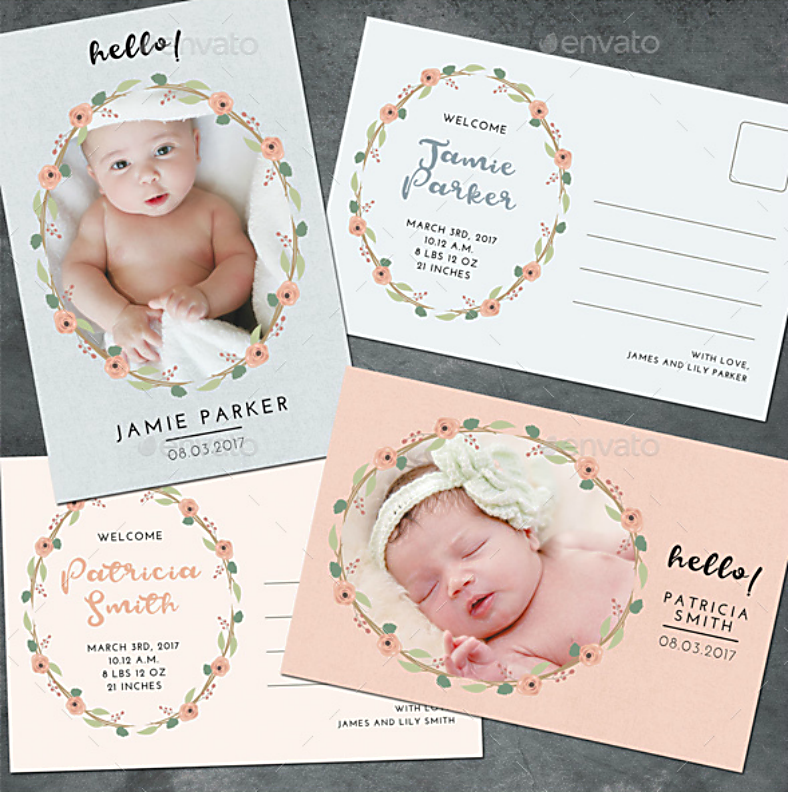 Though you may be allowed to invite people informally through the phone or text message, baby announcement celebrations are supposed to be formal which is why you should invite your guests in the best and most formal means possible, and this is by sending out invitation cards. 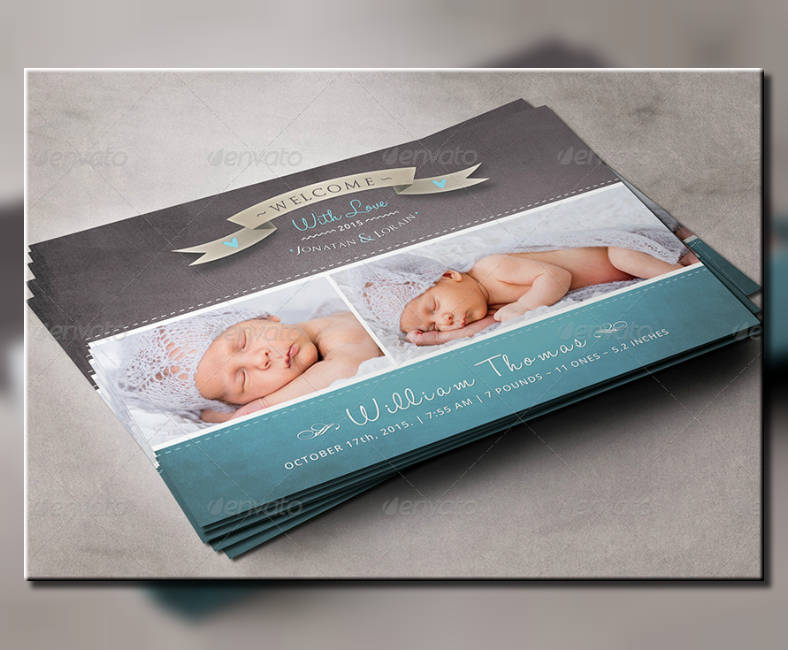 We actually gathered up some templates that you can use to invite guests, but these aren’t just any invitations, these are postcard templates and you can actually send them out without having to use envelopes. 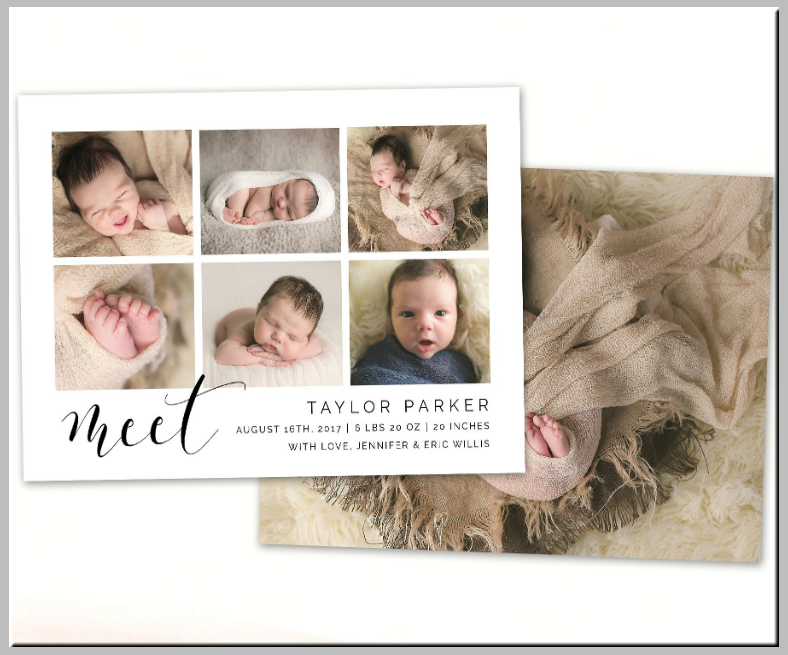 Wanting to send a baby announcement invitation postcard to your family and friends to let them know about the newest member of your family? Go ahead and download the template above, you can choose between two colors depending on the gender of your baby. A postcard is a small piece of printed cardstock or thick paper that contains a message from its sender. With a purpose closely similar to a simple letter, a postcard is already pre-printed with some graphical and textual elements and has a space provided for the sender to write their personalized message. The best thing about postcards doesn’t lie on its appearance and presentation, but the fact that it can be sent as it is without having to put it inside an envelope. Postcard samples are meant to be sent without an envelope, though there are some printing companies that still include an envelope in the packaging when manufacturing and distributing their postcards. What you will need, though, when mailing postcards is a postage stamp that you will need to affix somewhere on the backside of the card. 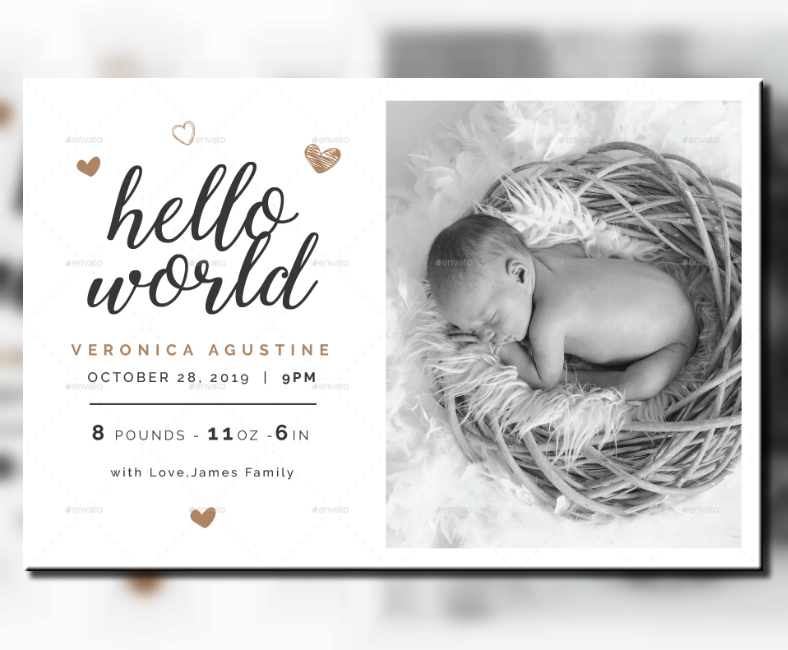 Keep it simple but still very elegant with this amazingly adorable sample postcard template. 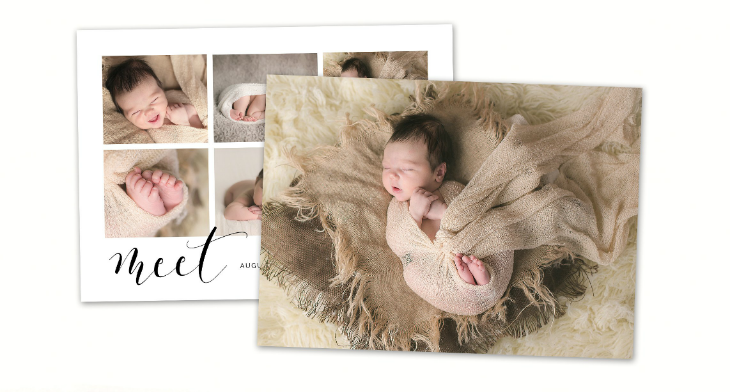 The front side of the card shows several thumbnail images of the baby while the back part shows a single full page image of the baby. What Happens during a Baby Announcement Celebration? In many traditions, the practice of holding baby announcement parties—or birth announcement—is mainly to alert the family and friends with regards to the birth of the baby. Baby announcements are commonly done within the first year of the baby and the notice will include several information about the baby. 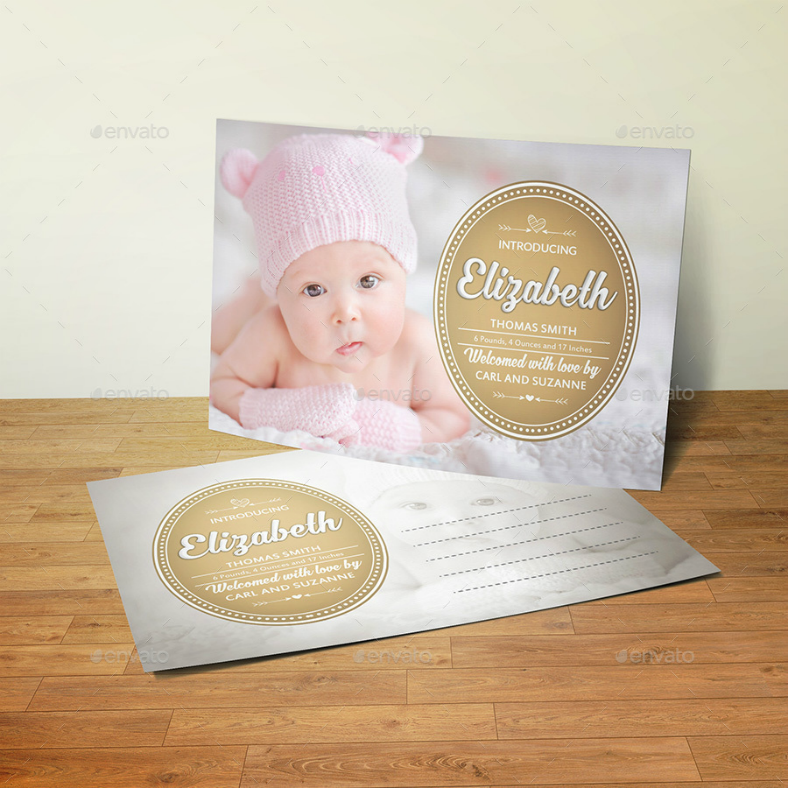 The most common information that are included on a baby announcement are the baby’s name, the date and time of their birth, their birth weight and measurements, the location of birth, the names of the parents, one or more pictures of the baby, and a statement that invites the reader to an upcoming celebration in honor of the mother and her newborn baby. 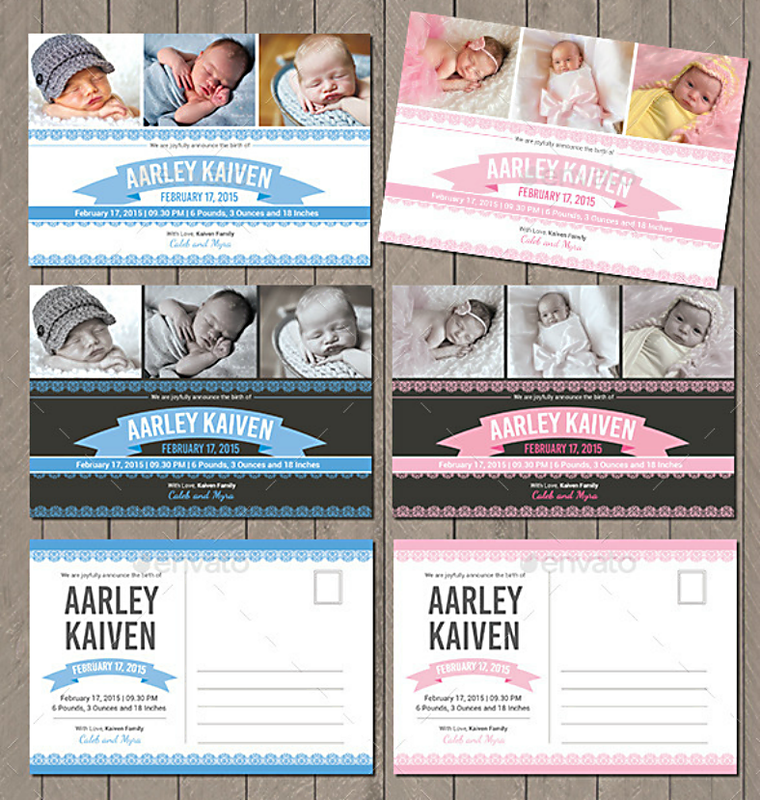 You may also see printable birth announcement templates. In Europe, they have a much more exciting way of doing a baby announcement. They actually publicize their baby announcement by having it published in their local newspaper. 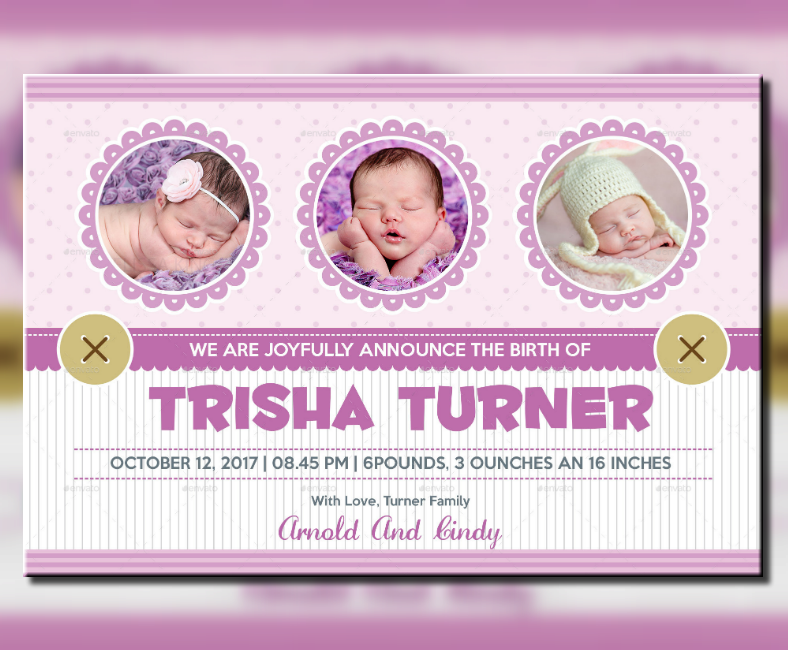 You may also see birth announcement templates. Here is another postcard invitation which involves the use of several thumbnail images that you might also be interested in, the only difference with this one is that it combines the use colored and monochrome images. If this one seems more preferable to you than the previous one, then go ahead and download it. Are you looking for something that’s straightforward? 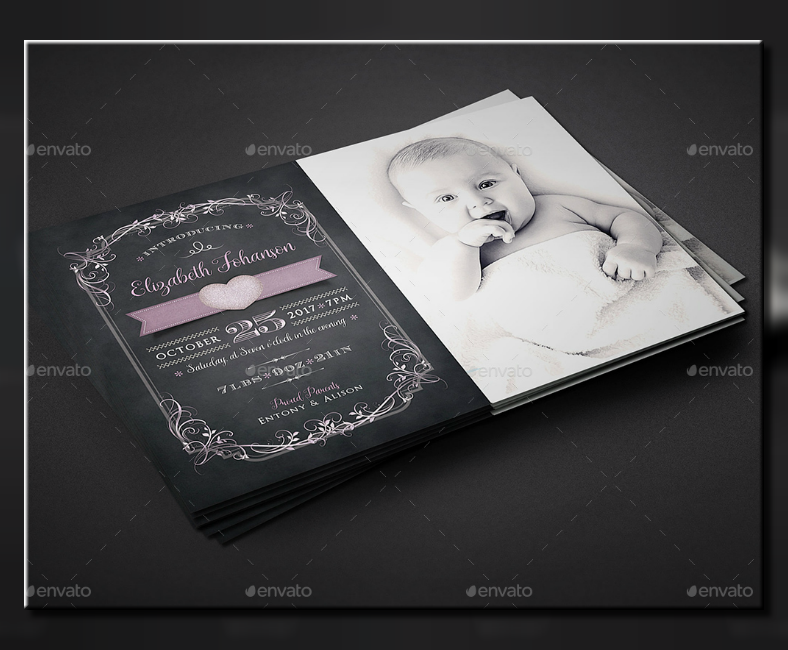 Check out the modern postcard template above and see if it suits your preferences. This template is highly simplistic in that it only includes one photo of the baby on the front side, which is already enough to make the template look attractive. The backside of this card is a space provided for the sender to write their message as well as for the postage stamp. The simple switch from a colored photo to a monochromatic one creates a big difference in terms of appearance and essence. 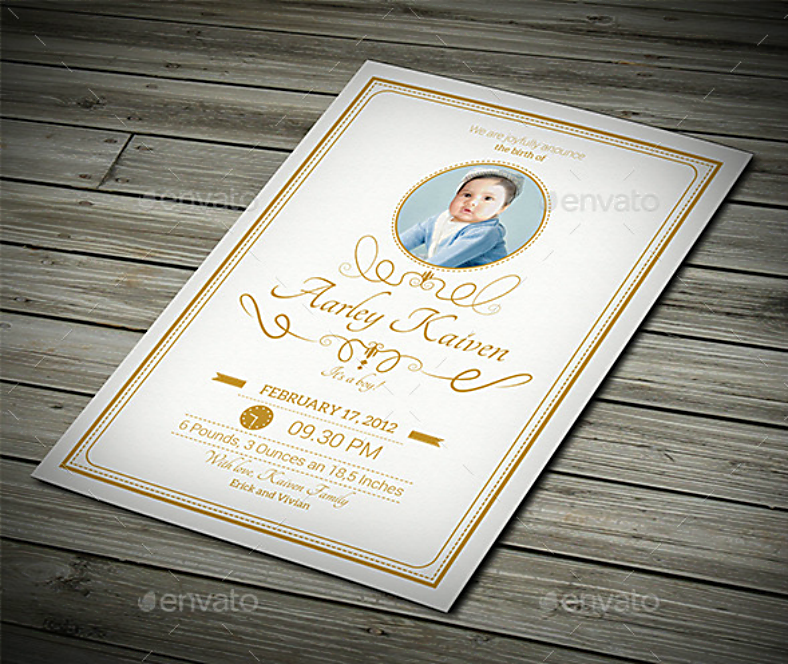 This is what makes this template beautiful especially when paired with a calligraphic text. Hello, world indeed. If you are looking for a design that doesn’t shy away from the use of a lot of white space, then the postcard template above may be what you are looking for. 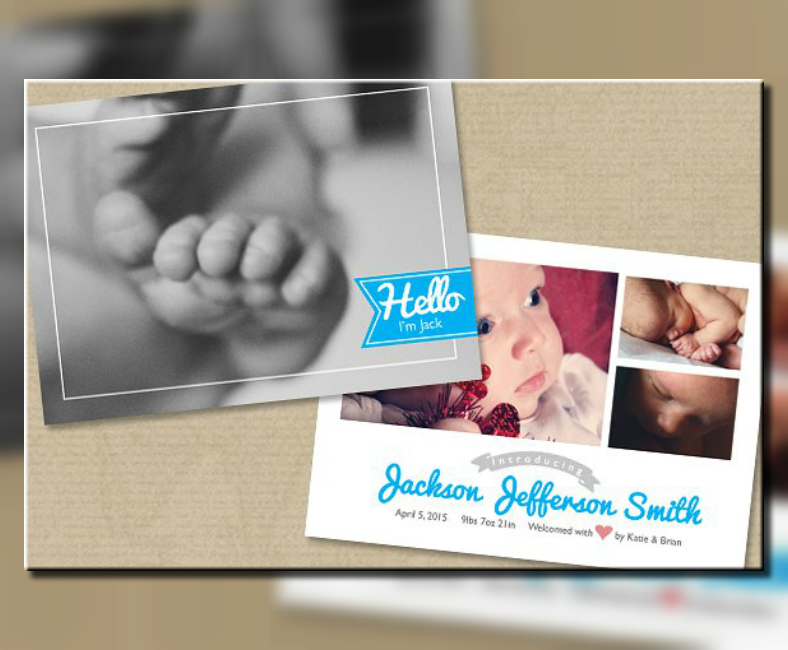 You may also see pregnancy announcement card templates. If you like rustic and vintage themes, then you will surely like the vintage postcard template above since it is also rustic-themed. This would be the perfect template for those couples or families who are living near the countryside or are simply planning on holding their party by the countryside. 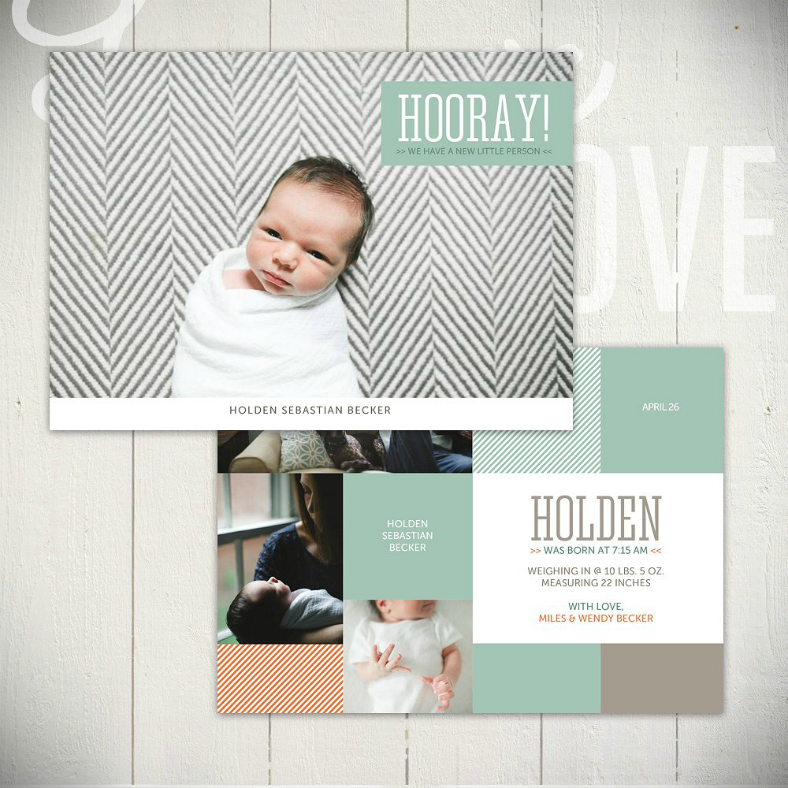 If you prefer something that’s different from the rest of the templates that you have seen here, you may want to go with the printable postcard template above to make your baby announcements. What makes this template different? 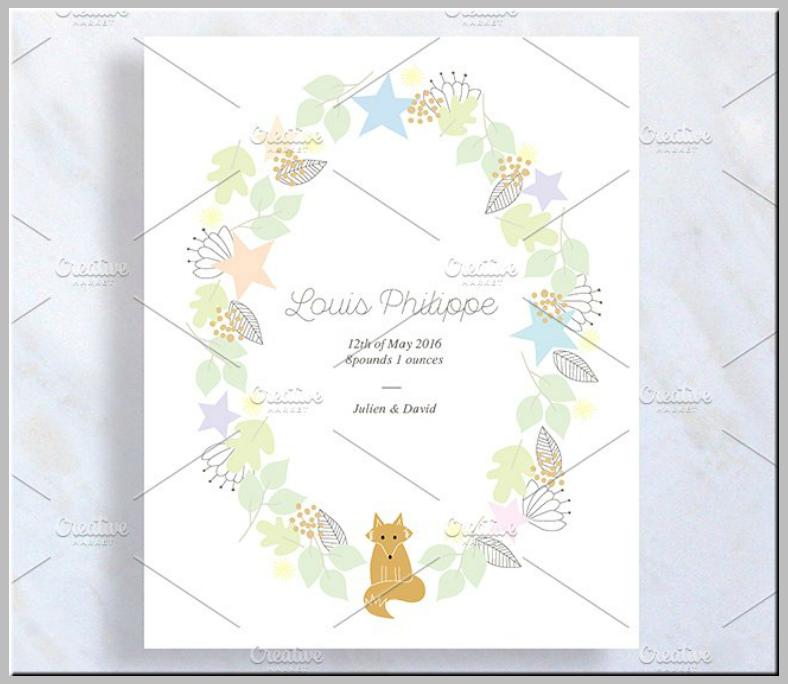 It doesn’t actually show an image of the baby, it just includes a watercolor-inspired illustration of a plant wreath with a fox on the bottom edge. Have you ever had a baby of your own? Or if not, have you ever tried caring for a baby? Were you able to notice things about them that seemed surprising? There are actually a lot of characteristics that are common among most babies, and we are here to share some of those to you so that the next time you’ll be caring for a baby, you can immediately determine whether that unusual observation is normal or not. You may also see baby thank you cards. Anatomically, the size of the baby’s head is quite large for its body. In fact, the head of the baby makes up for about 25% of their total weight and around the same percentage for the baby’s overall length. You may also see anniversary announcement designs. Don’t force your baby to see you or images at a distance because they can not, their eyes are not yet fully developed for that. Babies are only able to see high-contrasted achromatic images—meaning black and white—and can only focus on images and subjects that are within ten inches from their eyes. Normal adults have around 206 bones in the body, but do you know that when babies are born, they have a total of around 300 bones? They do, and as they grow up, their bones start to fuse together. You may also see business announcement postcard templates. Babies have over 30,000 taste buds on their tongue while adults only have over 10,000. But even with this massive number, babies are actually unable to taste salt until they are four months old. According to research, this delay may have a connection to the development of the kidneys, which begin to process at that same age. You may also see promotion announcement templates. The first sense organ to develop in a baby is its inner ear, which already fully develops even before the baby is born. Because of this, babies will already have a very sophisticated sense of hearing and are already capable of hearing outside noises from within their mother’s womb. You may also see thank you postcard templates. Babies can swallow and inhale at the same time, which makes them highly susceptible to incidents of aspiration or choking. Because of this, it is very important to position the baby properly during and right after feeding, avoid placing them in a seated position for about an hour and a half after feeding. You may also see engagement announcement templates. You just welcomed a new member to your family and you are more than just proud to share that happiness to the world, but you don’t know how to do it in the best and most memorable way possible. Yes, you may want to host a party and are even looking forward to having your family, relatives, and friends join you, but just like any party, this one needs some careful planning for the celebration to be successful and worth sharing to the child once they grow up. You may also see business announcement templates. Before the birth of the baby, most pregnant women would throw a baby shower or a gender reveal celebration wherein the guests would give gifts to the mother which are intended for the baby. After the baby’s birth, on the other hand, the most common and easiest to plan party would be a meet-the-baby party with a concept that’s somewhat similar to a baby shower. Though most mothers would prefer either a baby shower or a post-birth party to save on the expenses, there are also some that would go for both. Going back to planning the party. Yes, you will definitely need to plan this especially if you’re planning to have guests around. You will need to plan everything from the date and time, down to the overall budget that you are willing to spend for the party. The food and drinks need to be more than just enough for the guests and the venue should be decorated appropriately for the event. Once everything’s been planned accordingly, the success of the party should follow. You may also see staff announcement templates.